BETTER BLUEBERRY PLANTS. REAL BLUEBERRY FARMERS. Our 103 year-old family blueberry farm sells and ships the best certified blueberry plants at the lowest prices. DiMeo blueberry plants grow larger than average, way better tasting blueberries. Buy ORGANIC, Non-GMO, Heirloom ultra-heavy bearing BIG 3 year-old blueberry bushes. Only $10 each. Ready to Fruit this Summer 2019. Or invest in 1.5 year-old starter plants for only $1.95 each. ORDER NOW in Mid-April to secure inventory availability before we sell out. Just like the happy customers on our Facebook with over 88,000 likes. Stop overpaying for expensive tiny little half-pints of blueberries. Grow your own organic blueberries at home and save money. If you pick-up your order now in Mid-April, we can sell you up to 4' ft. tall certified blueberry bushes. Only $10. Call now (609) 561-5905 for a fast April or May 2019 shipping quote. We ship when you are ready to plant. 1.5 Year-Old Blueberry Plants (only $1.95 each) (minimum 50 per order) these are multi-branched, established beautiful plants. You can plant them directly out in your field, patch, or easily pot them up to get them more established into large bushes first before you ground plant them. Shipped farmer-direct to your door when you are ready to plant this Spring 2019. You can start off with 600 plants (1/2 acre) to 1,200 plants (1 acre) or whatever amount you are comfortable starting out with. It’s up to you. Planting a nice big patch of blueberry bushes will increase your property value while allowing you to claim farmland tax assessment and greatly reduce your taxes. 2 Year-Old Blueberry Plants (only $4.95 each) (minimum 25 per order) perfect for replanting, starting a blueberry patch, u-pick blueberry farm or roadside fruit stand which will be profitable in this high demand “locally grown” organic blueberries market. Ready to Fruit this Summer 2019. We can ship you a nice mix of blueberry plant varieties for an extended blueberry season, good cross-pollination, large tasty, better flavor farmer-recommended blueberries. Shipped farmer-direct to your door when you are ready to plant this April or May 2019, or schedule an appointment to pick-up your order at our family farm. 3 Year-Old BIG Bearing Blueberry Bushes (only $10 each) (minimum 5 per order) these are the blueberry bushes that homeowners and home gardeners buy. Perfect for growing your own organic blueberries at home in your own little blueberry garden, patch, edible landscaping, hedgerow or in pots. We recommend ten (10) blueberry bushes per household so that you have enough blueberries for fresh eating and freezing throughout the year. Ready to Fruit this Summer 2019. We can ship you an "all-season variety pack" for a nice extended blueberry season all Summer long. 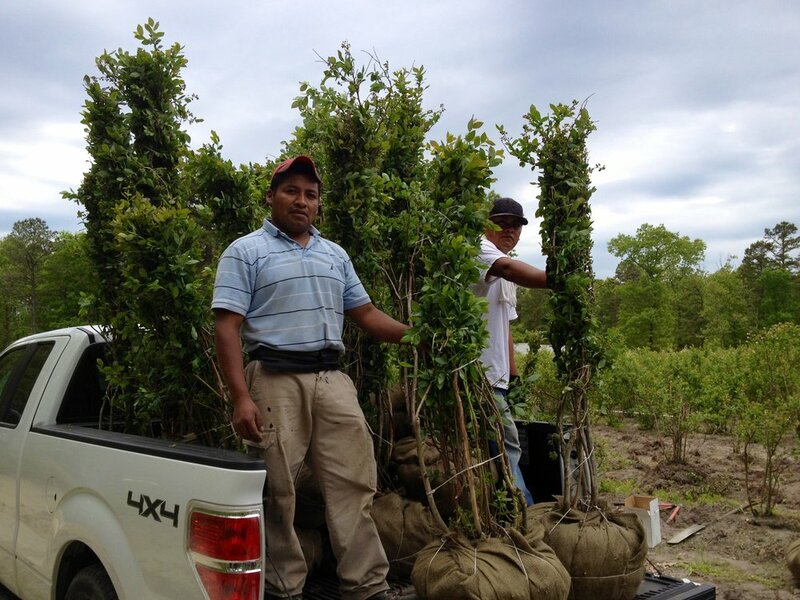 Shipped direct to your door when you are all ready to plant this April or May 2019 or pick-up giant bushes like these happy customers. Ask about DiMeo's All Summer-Long 2019 Variety Pack. Our family blueberry farmers will ship you ten (10) blueberry bushes that can fruit early, mid and late blueberry picking seasons. Giving you fresh, large, tasty organic blueberries all summer long this Summer 2019. Ten (10) bushes is what we recommend for an average household of 5 people. Two bushes, per person. This way you can have enough blueberries to enjoy all year long. Plant 2.5' feet apart. They will grow beautiful in pots, barrels or raised beds. Call now (609) 561-5905 for a fast Spring 2019 shipping quote or pick-up rare heirloom blueberry plants like these happy customers did. DiMeo's 2019 All-Summer Blueberry Variety Pack offers the things that home blueberry growers and gardeners are looking for #1) a nice extended blueberry picking season all summer long #2) good cross-pollination to increase yield and production #3) bigger blueberries #4) tasty blueberries #5) flavorful, better tasting blueberries. Call now (609) 561-5905 to get a Spring 2019 shipping quote. We ship to small home gardeners, commercial growers, edible landscapers, fruit wineries and pick your own blueberry farm start-ups all across America. Just like these happy customers who drove hours to buy blueberry bushes direct from our family blueberry farm in Hammonton, New Jersey. The below video is an example of the ultra-heavy bearing nature of DiMeo blueberry plants by our family blueberry farm. Blueberries are easy and super-healthy berries to grow. Enjoy picking your own blueberries for generations with giant blueberry plants from our family farm. Our 3 year-old ultra-premium SUPER HARDY, big bearing-size blueberry plants are easy to grow. We give you blueberry planting instructions and free blueberry farmer tips when you purchase our amazing blueberry bushes. When you buy-direct from us, we hand-dig your certified blueberry plants order. Watch below to see that our DiMeo blueberry bushes are the best that any backyard blueberry gardener or commercial grower can buy. We have the LOWEST PLANT PRICES with way higher ultra-premium quality. We invite you to take a ride (or fly) out to personally pick-up your order at our DiMeo family farm, just like these happy blueberry plant customers did. Look at "the DiMeo difference" in this video below which shows how we grow the best certified blueberry plants in the beautiful NJ Pine Barrens. Our New Jersey blueberry farm sells and ships the best certified blueberry plants and large blueberry bushes direct, all year-round. Our bigger, bearing-size 3 year-old $10 blueberry bushes will grow GIANT quarter-size tasty blueberries this Summer 2019. One of our family blueberry farmers can take the time to speak with you at no cost, in detail via telephone about things such as blueberry farm site selection, blueberry soil preparation, watering, mulching, fertilizing and harvesting your blueberries. We are America's #1 choice for the best blueberry plants. Healthy-driven families, like this one below, love driving here to pick-up their starter blueberry plants order to plant a blueberry patch in their backyard. We do not list all of the possibly up to 32 different blueberry plant varieties that we can have in stock or have access to, because our inventory can change daily, which means we would need to update our website daily. Call now (609) 561-5905 if you are looking for a specific blueberry plant variety. Chances are we have it. We mainly promote older "heirloom" blueberry plant varieties because the blueberries are much better tasting than regular commercially grown blueberries. But you can either take our recommendation or you can request another particular variety of your choice. Over the years, our blueberry farmers have experimented with nearly all of them. We know which types really do have the best crop yield, production, taste, flavor, vigor, etc. So we can handle that and take care of you like we did for these happy customers and their adorable kids. Up to 85% of the pick your own blueberry farm business demand lasts from early to mid blueberry season. Because as it turns into late summer, public interest level quickly drops when most Americans are taking their final summer vacations and parents are starting to get kids ready to go back to school. Unless you have a contact with a restaurant chef, local CSA, or farmers market that wants to buy your locally grown organic blueberries until the very end of summer. We recommend you put the majority of your investment dollars on early or mid-season blueberry plant varieties for this reason. When you buy plants from real blueberry farmers, this is the kind of valuable information you can get when you speak with us. We prepared this below order for a landscaper who will plant and sell them for big bucks, but you can buy them from us at wholesale prices. The picture below is what blueberry bushes look like during the fall season if used as an edible blueberry hedge row on your property. Of course, you can let them grow bigger or even higher if you want, but the key is to just keep your blueberry shrubs trimmed to your desired height or size. When planting blueberry bush rows for an edible blueberry hedge row, simply plant each blueberry bush 2' feet apart. The blueberry bush leaves will turn a beautiful vibrant red wine color in the fall. This fall foliage is perfect if you want to enjoy blueberry bush fall colors at your home with blueberry plant fall foliage that can last through the winter with solid red blueberry cane branches that will look beautiful for your winter landscape design. Instead of planting evergreen trees, put your yard to work for you, and grow organic berries with an edible landscaping investment that will pay you dividends for a lifetime. DiMeo's old fashioned raspberry plants nursery sells and ships the best 3 year-old bearing raspberry plants. Buy cold-hardy raspberry bushes on sale for only $10 each. Organic, Non-GMO, Heirloom raspberry plants. Ready to Fruit this Summer 2019. Large fruit. Very productive. Excellent flavor. Minimum order of five (5) raspberry bushes per order. We recommend ten (10) raspberry plants for a average family of 5 people. Two plants, per person, per household. Raspberry plant spacing is just 18" apart. Our popular giant raspberry plants will grow loads of plump, tasty red raspberries for you this summer. We also have beautiful thornless organic blackberry plants for sale. High quality fruit. For those of you who have children, this is the perfect option for you, so you don't have to worry about the kids getting stuck with all those sharp blackberry thorns. Ready to Fruit this Summer 2019. Most winter hardy of all thornless blackberry varieties. Highest production yields in recent university tests. Good flavor. You can pick them up at our farm’s nursery or we can ship blackberry bushes for sale direct to your door. Only $10 each. Grow your own organic blackberries at home just like this happy DiMeo customer did in pots, right in her backyard. Few people know about the health benefits of aronia berries. Let DiMeo Farms educate you on a SUPER-HEALTHY berry that can change your life. Aronia berries are the healthiest berries on the planet. The aronia berry is actually a close cousin of the blueberry. Aronia berries are now known for the fact that they have the highest ORAC value, higher than any other berry and 3 times the antioxidants of blueberries. Also a gorgeous berry bush for edible landscaping with aronia berries and powerful healthy berry. We have BIG bearing-size 3 year-old aronia berry bushes for sale. Only $10 each. Pick-up or we can ship direct to your door when you are ready to plant this Spring 2019. Call now (609) 561-5905 for fast quote. Every spring, aronia berry bushes are covered with clusters of white, sweet, scented flowers followed by pretty aronia berries that turn a bluish-black color in summer into early fall. Then you can enjoy its red wine fall foliage colors. It's a blueberry size healthy super fruit that can be eaten fresh. It is best known for making healthy organic aronia juices and also blends nicely with organic fruit juices or speciality wines. Aronia berry bushes are also fairly drought tolerant. Our 3 year-old Aronia berry plants are ready to fruit this Summer 2019. Only $10. We can ship aronia plants direct to your door. Below photo is of one of our customers who planted and almost immediately picked her aronia berries. She got an instant return on her aronia berry plant investment. With our ultra-heavy bearing cranberry plants you will save money instead of paying high prices for cranberries. You don't need a bog to grow organic cranberries. Imagine a beautiful, solid carpet of green-leaved plants in your berry garden, each about 2' feet wide and 6" inches high. Bright red, juicy cranberries that you can pick by the handful with up to pounds of cranberries per bush. Our cranberry plants are vigorous growers that thrive in blueberry-type soils. Cranberries grow well in hanging baskets. Our cranberry plants are self-pollinating. Plant just 18" feet apart. Cranberry bushes make the perfect ground cover for edible landscaping. Only $10 each. Minimum order five (5) cranberry bushes. Call (609) 561-5905 for a quick quote. Cranberry gardeners love to buy cranberry vines from our cranberry plants nursery. The video below shows GIANT cranberries on our ultra-heavy bearing certified cranberry bushes that you can easily grow at home instead of having to buy them. OK, those are a few of the “other berry plants” we offer for sale here at the farm, just because so many of our customers ask us if we carry any other berry plants so we decided to stock a few, but let’s get back to blueberries. Below you can find helpful instruction videos and at the very bottom of this page you will find our blueberry planting instructions that are quite detailed. Here’s another load of blueberry plants ready to go. When you buy plants from real blueberry farmers you get higher quality berry plants from experts in the industry. When you become our customer, we can spend time with you and teach you how to plant blueberries the right way. Just look at our happy DiMeo berry plants customers on our Facebook photo gallery which features just a few of the many DiMeo customers, just like this 89 year-old customer of ours received his beautiful "small starter" Non-GMO, Heirloom blueberry plants (only $1.95 each) shipment. He was so excited to plant them. It totally made his day. His thankful son sent us a little thank you note and this adorable photo of his excited dad planting his new little blueberry patch with his cane in hand. God bless him. Let DiMeo blueberry farmers teach you how to prune blueberry bushes the right way. Our happy DiMeo customers asked for an instruction video on how to trim blueberry plants and bushes, well here's the first video, with more blueberry planting instruction videos to come. We are successful when our customers are successful in properly pruning blueberry plants like our DiMeo family does every early winter season once all the leaves fall off the blueberry bushes. This blueberry farmer video should give you an idea of just how hard you should trim or prune older mature blueberry bushes once the blueberry bushes are getting some age on them. Grandpop DiMeo had blueberry bushes up to 60 years old, that his father planted. More videos to come on how to properly fertilize blueberries bushes, watering, cultivating and mulching blueberry bushes properly with organic pine bark mulch. Our DiMeo family members have some blueberry fields well over 50 years old. DiMeo blueberry bushes can often live a long time before losing productivity, most up to 30 years or even more. Watch the video below of second generation DiMeo blueberry farmer M.DiMeo, Sr. (83 years old) replanting a field of old DiMeo blueberry bushes. He decided to start replanting blueberries in his blueberry fields during early fall blueberry planting season after the seasonal blueberry harvest was complete every years. He loves working on the blueberry farm and is still working to this very day. Just a few blueberry plants are removed, here and there, depending on which ones he felt needed to be replanted. He is not replanting the entire blueberry field, but rather, just certain small percentage of blueberry bushes. This is done every single fall or winter when the bushes are fully-dormant. The process keeps the blueberry field acreage as productive as possible as far as pounds and yield per acre. Many of our customers ask how to cultivate blueberries using the best old fashioned farming methods for both draining blueberries fields and working the blueberry soil to reduce weed growth and increase blueberry plant vigor. Some ask "what causes that ridge" the blueberry plants sit on top of, well here is the answer. Over time, as the bushes grow, you go up and down the blueberry field rows, in 2nd gear (high) on your tractor and carefully throw dirt up around the base of your blueberry bushes. Commercial blueberry growers use this special side winder disc. We not only have time tested blueberry farming and best blueberry growing methods, but we can get you just about any equipment at our cost. We have contacts in the blueberry industry, which is another reason why people choose to buy certified blueberry plants from DiMeo Farms. We can even teach you how to prune blueberry bushes properly after harvest is completed. There is a old fashioned blueberry pruning method to trimming blueberry bushes to increase blueberry crop yield per acre and maintain strong hardy blueberry bush growth that can produce more pounds of blueberries per acre. Watch below video of the DiMeo farmers brush cutting and trimming blueberry bushes in this video on how to care for blueberries after the annual blueberry harvest. Notice the 9' foot wide blueberry field rows, so when the standard 6' foot brush hog goes down the row, it has 1.5' clearance on each side. Notice the bushes are only 2.5' foot apart. Our family plants them that close because thats proper spacing. Spacing blueberry bushes farther apart will not necessarily increase blueberry yield or production as some people think it will. If you are homeowner who just wants to plant blueberry bushes in your backyard, then of course you can space them farther apart. As a DiMeo blueberry plants customer, we will happily help you with proper blueberry farm land selection and teach you what to look for before you purchase farm land for growing blueberries. With an expert DiMeo blueberry farmer, you are in the best hands. We restored an old farm property to start a new pick your own blueberry farm and u-pick agritourism farm as an example for our customers. We want you to be successful growing your own blueberries and see our DiMeo blueberry farming family clearing new blueberry farm properties to be restored into successful u-pick blueberry farms in New Jersey. Now our fourth generation continues growing New Jersey blueberries. Watch video of second generation blueberry farmer DiMeo, Sr. working with fourth generation DiMeo farmer to prepare another wholesale blueberry plants order for our happy DiMeo customer at the blueberry bushes nursery in New Jersey. If you have an old blueberry patch or farm and want to learn how to plant blueberries or how to replant blueberry bushes, we can teach you the right way to replant your blueberry patch or fields. For generations, our DiMeo family has been replanting blueberries as the productive blueberry fields age. In the video below you will see our family replanting blueberry plants at a 60 year-old blueberry farm field that needed some replanting. Now these dosen't mean that the entire field is replanted, just a small percentage of the bushes every year. You might be surprised just how hard Farmer DiMeo, Sr. cuts back his blueberry replants, but this "agressive cut-back" its what he recommends and what the DiMeo family has done for yeras. The new blueberry bushes should be substantially cut back for proper transplanting of blueberry plants to minimize transplant shock. Watch the video below and listen to the old-fashioned DiMeo Farms recommended blueberry replanting method. Notice not to plant your blueberry plants too deeply when planting or replanting, like these shown in Farmer DiMeo's old blueberry farm fields. It takes place right after blueberry season is finished. Blueberries are a tasty and healthy berry, borne on a plant beautiful enough to be an ornamental in your backyard or backyard organic berry garden. Blueberries can be easy to grow, require little space (only 2.5' feet between each blueberry plant) and are seldom bothered by pests. They can increase the value of your property, as home builders and realtors both come to to buy blueberry bushes from us, because a little blueberry patch actually becomes a big selling point. Home gardeners love the idea of having a blueberry patch in their backyard. With a few basic steps, planted right, your blueberry plants can pay dividends for a lifetime of fresh blueberries. Let DiMeo Farms teach you how to plant and grow organic blueberry bushes the right way. Follow our easy farmer blueberry planting tips and blueberry planting instructions for success. We can have or have access up to 32 or more blueberry plant varieties, but we recommend the most popular and productive blueberry varieties to grow. Of course, our inventory can frequently change. We recommend at least two (2) blueberry bushes per person, per household. For example, if you are a family of four, we recommend at least ten (10) blueberry plants for a household of that size. Select a sunny location. As sunny as possible. Blueberry plants prefer direct sunlight, but many of our customers have been successful with only 4 to 6 hours of sunlight per day. If you have almost total shade, then consider buying aronia berry plants instead, as they thrive better in the shade. Blueberry planting soil should be well drained, free of weeds and well worked. Locate your blueberries bushes where water is available. Blueberry plant roots should be kept moist at all times (but not soaked or saturated) throughout the blueberry growing season. If your blueberry plant soil is poor or marginally drained, then go with raised beds up to 3' feet wide and 12" inches high works well. But you should only ridge up your blueberry field rows if you have a drainage problem. Incorporate 50% peat moss into your existing soil. Dig a hole THREE TIMES the size of a bowling ball. If your soil is not sandy, then just completely discard it, and replace it with a mixture of 50% sand and 50% peat moss. Peat most is critical for long-term successful bluebery plant growth. If you don't have peat moss, we can sell you the best blueberry peat moss for PICK-UP ORDERS ONLY. We DO NOT ship peat moss. But you can easily buy it locally in 3.8 cubic foot bags. The DiMeo Farms recommended proper blueberry soil mix is a mixture of 50% sand mixed with 50% peat moss. Remember, blueberry plants thrive in acidic organic soils which you can create easily with a mixture of just sand, peat moss and Holly Tone which is a granular acidifier you can easily purchase online or at Lowes, Home Depot or WalMart. The same goes for the sand, Home Depot and Lowes sell it in large 50lb bags in the masonry section of the store. 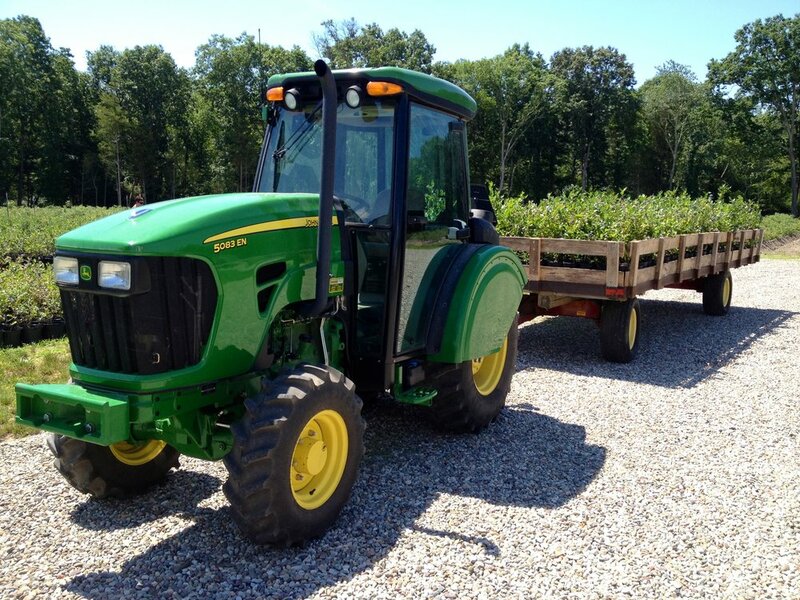 Once you become a DiMeo Farms customer, if you are planting at least several acres of land, we can connect you with our peat moss supplier who can ship you peat moss by the tractor trailer load. We will get you our low wholesale peat moss prices. Our DiMeo family has been dealing with the same privately owned peat moss bog for decades. FYI. His minimum order is 24 pallets of peat moss. 30 bails per pallet. So that's 720 bails of peat moss per trailer load, which comes to about $5,000. So this only applies to those of you who are planting measurable blueberry acreage of 3 acres or more. Plant blueberry bushes only 2.5' feet apart between the actual berry plants in the row. If you are planting an edible blueberry hedge row then space 2' feet apart. The spacing of your rows will depend on what kind of implements you are using. For example, if you are home gardener you might want to just plant grass and mow between the blueberry rows with a lawn mower. If you are a small farmer or have a small PYO berry farm, you might want to cultivate between the rows with a 6' wide disc, cultivator or mower brush cutter which means that you will need 9' between rows. Just because you space your blueberry bushes farther apart, does not necessarily mean that you will see an increase of blueberry yield, production or productivity. Its a cosmetic thing depending on your individual yard design and intent with your blueberry plantation. As mentioned prior, dig a hole about THREE TIMES the size of a bowling ball, then mix 50% sand with 50% peat moss. Place this mixture in the hole you dug to plant the blueberries plants. Then take the Holly Tone for acid loving plants, and put a few table spoons of it in a circular band around the base of the planted blueberry bushes. Pine bark mulch is good for water retention and improves berry plant health. We recommend up to 4" of untreated pine wood chips. Avoid using leaves, grass clippings or sawdust as mulch as they inhibit hydration. If using these mulches, you may want to use a little extra nitrogen to maintain blueberry plant growth. Blueberry bushes do best with up to 4" inches of cedar or pine wood chips on top of the roots to conserve moisture, prevent weeds and add fully composted organic matter. If you use peat moss then you are giving your blueberry plant the long-term organic matter it loves. Keep raspberry plants well watered to maintain moisture and establish raspberry bushes with little stress. For raspberries planting is 18" inches between each raspberry or blackberry plant for spacing. Spacing between your raspberry rows will depend on what type of machinery you are using to cultivate or mow between your raspberry rows. We recommend yearly fall raspberry pruning for increased raspberry bush health. Fall pruning raspberries also helps to prevent winter damage. We have reduce winter damage by pruning our raspberry plants in late fall and cutting them down to around no taller than 21" inches. At our blueberry plants nursery, we try to be aggressive with our blueberry pruning and other raspberry pruning strategies. As soon as summer blueberry harvest ends, we usually begin pruning blueberries as soon as the leaves fall off in early fall. Its important to wait until all the leaves fall off so you can see what you are pruning off the bushes. Otherwise, it can be difficult to see. We know many of you would like to know exactly how to properly prune blueberry bushes and we are still working to put together a new YouTube video to show our blueberry plant customers exactly how to prune blueberry plants the right way. We recommend using drip irrigation placed at the base of the blueberry plants. Then you can apply water at your convenience and know the water is getting to the blueberry root zone where it is needed most. Because of blueberries shallow root system, they may require frequent watering. Maintain moisture, and do not allow roots to dry out, but do not saturate or soak them. Water as needed, depending on warm temperatures and any lack of normal rainfall. Every year, older more mature blueberry bushes should be pruned to avoid over-fruiting, which results in small fruit or overall lack of plant vigor and growth. Remember to always keep the soil moist throughout the establishment period of blueberry plants. Especially during the first 6-8 weeks after planting. Invest in a small automatic timer that you can attach to your drip irrigation hose so you don't forget to water. It's easy. Drip irrigation hose is cheap. If you buy drip irrigation hose commercially, it comes in 1000' foot rolls of drip irrigation hose which should only cost you about $150 per roll. You can order it online and have it shipped. Remember that drip irrigation hose is all low pressure so that means it doesn't take a big irrigation pump or a big irrigation well to water a small patch of blueberries. In many cases, you can hook it up to a garden hose. For example, if you only have 1/2 acre of blueberries to water. That's only 600 blueberry bushes to that half acre. You can literally break that area up into two different watering zones and then water it with a garden hose spigot off your house. Once again, it's all low pressure irrigation so it does not take a complicated or costly system to power your blueberry irrigation. To water an entire acre of blueberries bushes (1,200 blueberry plants) spaced 2.5' feet apart, so a total of 3,000 feet of field rows needed to be irrigated, divided by 1,000, because drip irrigation comes in 1,000' foot rolls, so that means, you only need 3 rolls of drip irrigation to water your acre of blueberries plants. Each roll of drip $150 per roll, so that only $450, which is cheap. Of course you will need some fittings and some extra stuff like that, but its not expensive. Remove any dead blueberry wood that might develop over time as the blueberry bushes age. Also take off any non-vigorous or twiggy wood. Remember, the biggest and greatest number of blueberries will come off the young blueberry cane. First year and second year new growth. Keep the bright colored healthy, young blueberry wood. Remove blotchy-colored or short growth. If 1/3 to 1/2 of the wood has not been removed by the above steps, thin out the fruiting laterals and small branches until this balance has been obtained on the entire blueberry bush. Many people don't understand how to properly plant a blueberry bush, so we make a blueberry pruning video below for you to watch. Keep in mind that the berry bushes shown in the video are older mature blueberry bushes. Never fertilize blueberries plants at the time of planting. We recommend using organic, slow release fertilizers. A mixture of 1 part kelp, 3 parts fish meal and 3 parts bone meal works well if you want organically grown blueberries. Apply in early Spring. Or use an acidic additive such as Rhododendron food (5-5-3) a.k.a Holly Tone for acid-loving plants like blueberry bushes. Avoid using any kind of manure on any of your berry plants and always water well after fertilizing in early Spring. Remember, you only fertilize once a year in early spring. If using non-organic fertilizer on newly planted berry stock, use just two tablespoons of 10-20-10 (or similar slow-release fertilizer) in late spring once plants are established. Be careful because blueberry bushes are sensitive to over fertilization. For subsequent years, use one ounce of fertilizer for each year of blueberry bush age, to a total of eight ounces per blueberry plant. Apply in early spring for best results. A good source of organic nitrogen is Blood Meal 12-00 instead of using ammonium sulfate. For best success with your blueberry plants, we recommend you measure and maintain your soil pH levels regularly. Keeping your soil pH levels between 4.5 to 4.8 is very important for your blueberry bushes. Adding some slow-release garden sulfur is the best material to use to reduce soil pH levels. Just don't put it down too heavy. Start off light and then take another soil sample about 6 months later. We will sell you certified organic sulfur if you need sulfur just ask one of our DiMeo farmers. We sell garden sulfur in large 50lb bags or in smaller amounts for home growers that need to buy garden sulfur for blueberries. Just please be sure to let us know ahead of time that you intend to buy sulphur, so we can make sure we have it in stock. Pack soil firmly around the blueberry plant roots when planting. Water your berry plants well. Especially during the first 4-6 weeks of establishment period. Keep the soil moist, not saturated. Avoid fertilizer burn by fertilizing only after berry plants are established with slow release organic or non-organic fertilizer. Do not soak the berry plants in water for more than one (1) hour after you receive them. If you can't plant them right away, then just temporarily pot them up until you are ready. Plant DiMeo Berry Plants immediately upon your receipt. Of course there is no rush if the plants are potted and you pick them up at the farm. In that case, you have plenty of time to plant and there should be no rush, just keep them watered. On starting a new pick your own (PYO) blueberry farm. The PYO blueberries business as well as pick your own aronia berries and other small fruit plants will be a very successful business during your retirement years. Agritourism and agritainment will be two very big businesses in the future and those of you who are "ahead of the curve" and get berry plants planted in the ground now will greatly benefit in the coming years. Food prices will continue to rise. We have baby boomers from all across America who call us to discuss how they want to have their own little berry picking farms set up and ready to go for their retirement years. We are very experienced can help you be successful. Stop by to pick-up your first load of starter plants. ONE CALL. ALL YOUR ANSWERS. CALL NOW.